Biceps so perfect, even Joe can’t stop looking. Lucky you: the eye candy continues until Dec. 16, when we’ll host a Manganiello-themed giveaway! 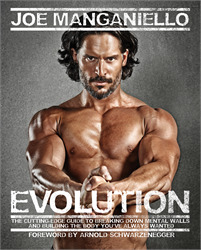 Joe Manganiello first gained recognition around the world for his incredible, sculpted body while winning both popular and critical praise as the star of HBO's True Blood. Now, from the man that Magic Mike director Steven Soderbergh called “walking CGI,” comes the cutting-edge guide to achieving the perfect body and therefore enhancing your overall quality of life. Mmmmm……to have those biceps wrapped around me…..